The Vineyard Theatre proudly announces its annual Gala, this year celebrating the institution’s 30th Anniversary. This milestone event will take place at The Edison Ballroom (240 West 47th Street) on Monday, March 18, 2013 beginning at 6:00 p.m. (cocktail reception at 6:00 pm, dinner @ 7:30 pm., and performances beginning at 8:30 pm). Single tickets (starting at $750.00) and tables of 10 are available by contacting The Vineyard’s Development Office at 212-353-3366 ext. 242 or development@vineyardtheatre.org. Balcony-level, performance-only tickets will go on sale March 1st. This year’s gala show, directed by Carl Andress (THE DIVINE SISTER), who helmed the non-profit theatre company’s gala tribute to Linda Lavin last year, will celebrate the institution’s 30th year of developing and producing bold new work at its home in New York’s Union Square. The theatre’s musical theatre legacy will be celebrated with all-star performances from award-winning Vineyard musicals. There will be a special tribute to AVENUE Q in honor of the 10th anniversary of the show’s premiere at The Vineyard, featuring original cast members, as well as performances from other Vineyard musicals including ELI’S COMIN’, THE SCOTTSBORO BOYS, [title of show], WIG OUT! and more. This evening will feature performances and appearances by renowned Vineyard artists and friends, including Victoria Clark, Patricia Clarkson, Billy Crudup, Peter Dinklage, Brandon Victor Dixon, Colman Domingo, Kathryn Erbe, Judy Kuhn, Anthony LaPaglia, Linda Lavin, Nicky Silver, David Strathairn, [title of show]’s Hunter Bell, Jeff Bowen, Susan Blackwell and Heidi Blickenstaff, original AVENUE Q cast members Stephanie D’Abruzzo, Jordan Gelber, Ann Harada, Rick Lyon, and John Tartaglia, and WIG OUT!’s McKenzie Frye, Angela Grovey, and Rebecca Naomi Jones, among others to be announced. The 2013 Vineyard Gala Leadership Committee includes Kathleen and Henry Chalfant, City National Bank/Richard V. McCune, Jill & Jim Gabbe, Ken & Rande Greiner, John Kander, Linda Lavin & Steve Bakunas, Julianne Moore & Bart Freundlich, Annette Stover & Richard Feiner, and David Schwartz & Trudy Zohn. The Vineyard Theatre’s leadership and staff includes Douglas Aibel (Artistic Director), Sarah Stern (Co-Artistic Director), Jennifer Garvey-Blackwell (Executive Producer), Michael Page (General Manager), Veronica Bainbridge (Development Director), and Eric Pargac (Marketing Director). 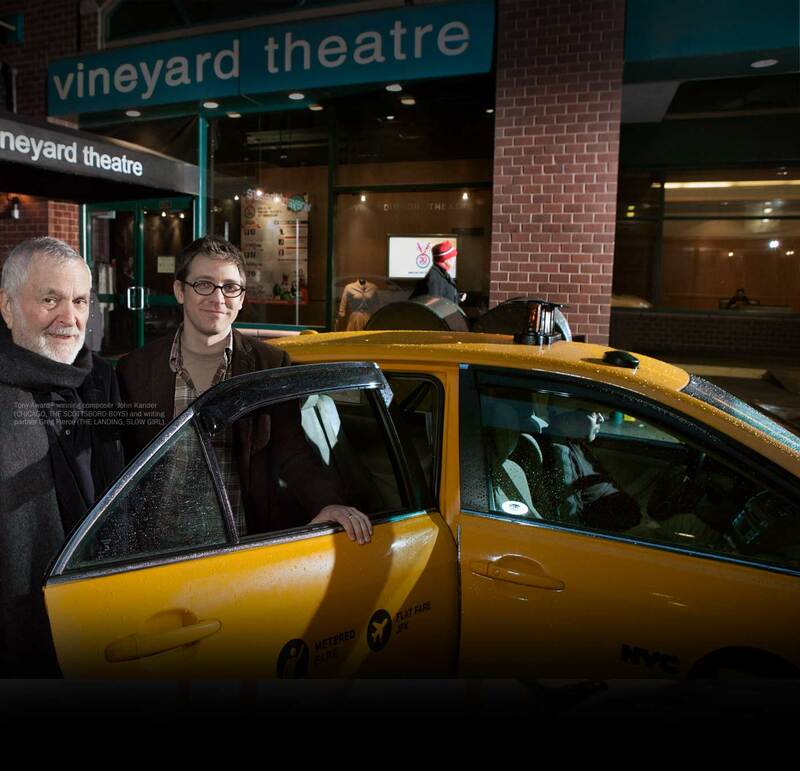 The Vineyard Theatre is one of the nation’s leading non-profit theatre companies. Dedicated to the creation and production of daring new plays and musicals, The Vineyard has consistently premiered provocative, groundbreaking works, including Nicky Silver’s THE LYONS; Marx, Lopez and Whitty’s Tony Award-winning musical AVENUE Q; Kander and Ebb’s THE SCOTTSBORO BOYS; Bell and Bowen’s [title of show]; Paula Vogel’s How I Learned to Drive (1998 Pulitzer Prize), Edward Albee’s Three Tall Women (1994 Pulitzer Prize); Gina Gionfriddo’s AFTER ASHLEY, Tarell Alvin McCraney’s Wig Out! ; Jenny Schwartz’s GOD’S EAR, Will Eno’s Middletown; and many more. The Vineyard’s productions have been honored with two Pulitzer Prizes, three Tony Awards, and numerous Drama Desk, OBIES, Outer Critics Circle and Lucille Lortel Awards.